When I was making gifts before Fathers Day I bought three plain vests for our Little Man and made the "SON" aplique on one of them. As I thought it looks fun I had an idea of making some apliques on two other ones. So I searched the Internet and found an Owl aplique pattern which I liked immediatelly. 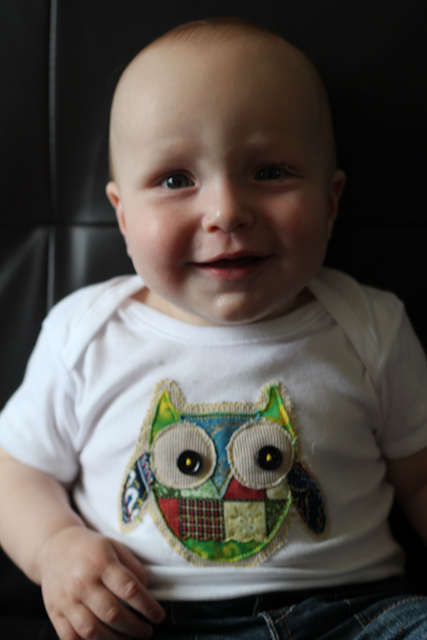 It was a bit too big for a 6-9 months vest, so I printed it out on 70% (not 100%) and made one for the Little Man. Absolutely gorgeous!! I love this! Thanks, Lauren! It was a really fun project I enjoyed. Especially the fabric and eye button picking part. This buttons really affect the look - smaller or bigger they really change the whole owl! :) And thanks again for the pattern!